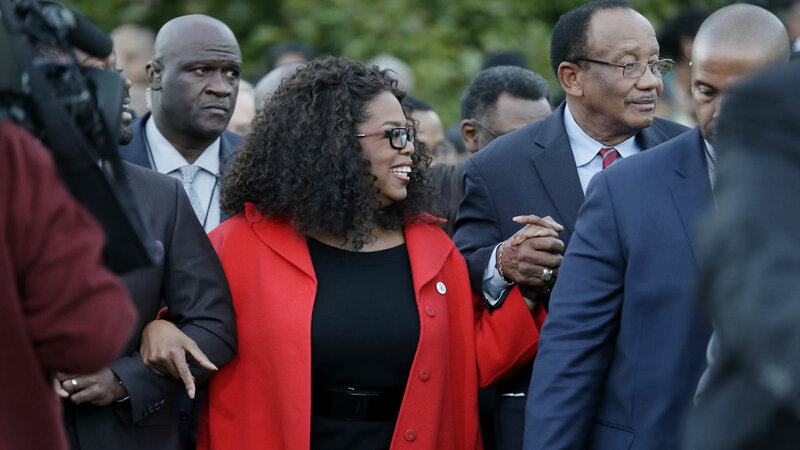 SELMA, Ala. -- Oprah Winfrey and other actors from the movie "Selma" marched with hundreds Sunday ahead of Martin Luther King Jr. holiday to recall the civil rights struggles of the 1960s. Their steps in tribute to King in Alabama came as key black members of Congress elsewhere invoked recent police shootings of young black men as evidence that reforms are needed to ensure equal justice for all. Winfrey, a producer of "Selma" who also had a part in the film, helped lead the Alabama march joined by actor David Oyelowo, who portrays King in the movie, as well the rapper Common. They and others seeking to commemorate a landmark moment in history marched to the Edmund Pettus Bridge in Selma where civil rights protesters were beaten and tear-gassed by state troopers in 1965. "Every single person who was on that bridge is a hero," Winfrey told the marchers before they walked up the bridge late Sunday around the time the sun was going down over the Alabama River. Common and John Legend performed their Oscar-nominated song "Glory" from the movie as marchers reached the top of the bridge amid the setting sun. Winfrey said those who came to Selma were seeking to remember "Martin Luther King as an idea, as Selma as an idea and what can happen with strategy, with discipline and with love." Winfrey played the civil rights activist Annie Lee Cooper in the movie, which has been nominated for two Oscars, in categories of best picture and best original song. "Selma" chronicled the campaign leading up to the historic march from Selma to Montgomery, Alabama, and the subsequent passage of the 1965 Voting Rights Act. Law enforcement officers used clubs and tear gas on March 7, 1965 - now called "Bloody Sunday" - to rout marchers intent on walking some 50 miles to Montgomery, the Alabama capital, to seek the right for blacks to register to vote. A new march, led by Martin Luther King Jr., began March 21 of that year and arrived in Montgomery days later with the crowd swelling to 25,000 by the time they reached the Alabama Capitol building. Lisa Stevens brought her two children, ages 6 and 10, so they could walk the bridge that King walked. "I wanted to bring my children here so they can know their history and for them to participate in this walk," said Stevens, who moved recently from New York to Greensboro, Alabama. She took her children to see the movie last week. "It's a part of their history and I think that they should know. Being that we're in the South now I want them to understand everything that is going on around them," Stevens added. McLinda Gilchrist, 63, said the movie should help a younger generation understand what life was like in the 1960s during the fight to end racial discrimination. "They treated us worse than animals," Gilchrist said of how marchers were treated. Monday is the federal holiday for King and already people around the country were remembering his leadership, some in light of the fatal police shootings that had shaken the U.S. in recent months, including the death of an unarmed black teen last year in Ferguson, Missouri. Eight members of the Congressional Black Caucus joined U.S. Rep. William Lacy Clay at Wellspring United Methodist Church in Ferguson on Sunday as they invoked King's legacy. They also vowed to seek criminal justice reform. "We need to be outraged when local law enforcement and the justice system repeatedly allow young, unarmed black men to encounter police and then wind up dead with no consequences," the St. Louis Democrat said. "Not just in Ferguson, but over and over again across this country." Other events planned on Monday's holiday range from a wreath-laying ceremony honoring King in Maryland to a breakfast in Boston, Massachusetts, and volunteer service activities by churches and community groups in Illinois. In South Carolina, civil rights leaders were preparing for their biggest rally of the year in the state capital , Columbia. The life and legacy of the Rev. Martin Luther King Jr. also was being celebrated at the church he pastored in Atlanta. The current pastor of Ebenezer Baptist Church, the Rev. Raphael Warnock, said the annual King holiday is a time when "all of God's children are busy spreading the message of freedom and justice." In the Sunday sermon, Professor James Cone of New York's Union Theological Seminary urged Ebenezer's congregation to celebrate the slain civil rights leader "by making a political and a religious commitment to complete his work of justice." Warnock closed the service by leading singing of the civil rights anthem "We Shall Overcome."